About 50 uniformed officers marched into Marjory Stoneman Douglas High School early Wednesday, just one aspect of the heavy security as classes resumed for the first time since 17 students and teachers were killed by a troubled teenager with an AR-15, thrusting them into the center of the nation’s gun debate. 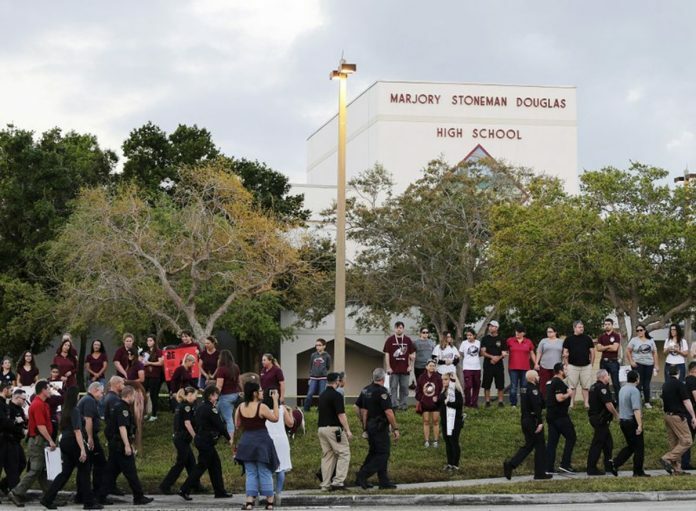 Grief counselors are on campus as well “to provide a lot of love, a lot of understanding” and help students “ease back” into their school routines, Broward Schools Superintendent Robert Runcie said. Officers with therapy dogs also stood outside. Volunteers passed out cookies and brownies to students. The students were also greeted by therapy animals including a donkey and two horses. One of the horses had “eagle pride” written on it. Parents of Marjory Stoneman Douglas victims were in Tallahassee on Tuesday as Florida lawmakers considered gun legislation. A House committee approved a bill that would raise the minimum age for long gun buyers and let some teachers carry arms. Today, backpacks were not allowed. The heavily armed police presence, designed to make the community feel secure, is also disturbing in itself, some students said. “This is a picture of education in fear in this country. The NRA wants more people just like this, with that exact firearm to scare more people and sell more guns,” said David Hogg, who has become a leading voice in the students’ movement to control assault weapons. “I know one of those bullets could be shredding through me if I was misidentified as a school shooter,” Hogg added. Wednesday’s class schedule started with 4th period, so that students and teachers could return to the people they were with during the shooting. The freshman building where the massacre took place remains cordoned off. 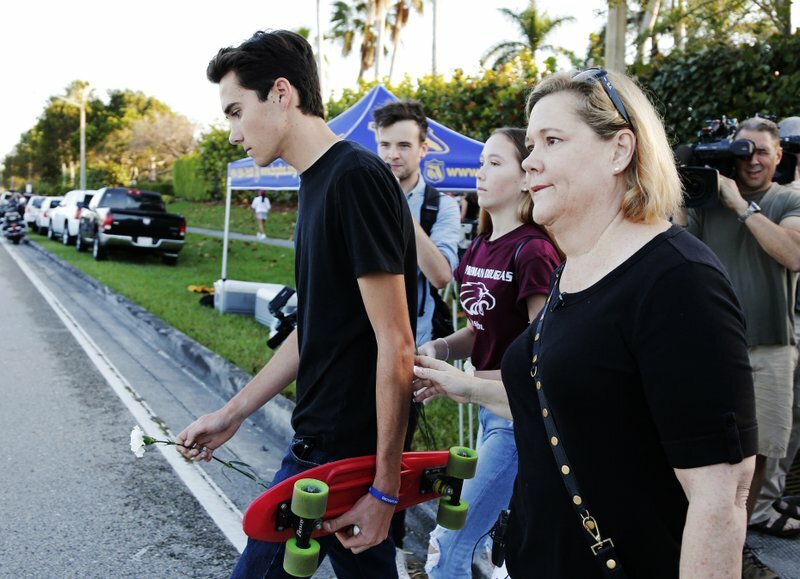 A long line of cars circled the school and dozens of television trucks and vehicles were camped out nearby as students, parents and staff were ushered through a security cordon, past a “Welcome Eagles” banner and a walkway lined with flowers, photographs and other memorials. Some were returning despite severe gun wounds, but even those who weren’t hit by bullets spoke of emotional trauma. Alexis Grogan, a 15-year-old sophomore, planned to wear a Stoneman Douglas color — maroon — on the first day back to class Wednesday, plus sneakers that say “MSD Strong, be positive, be passionate, be proud to be an eagle” and “2/14/18″ in honor of those who died. She feels nervous, like it might be too soon to go on as usual without slain friends like Luke Hoyer, who sat two seats behind her in Spanish. Still, the support from her fellow students, and their fight to strengthen gun control laws have buoyed her spirits. “I am so proud of how the kids at my school have been fighting because we all want change to happen and, as we see the progression, it really shows us that people do care and they do hear what we have to say,” Grogan said in a text message. The victims’ relatives kept up the pressure in Florida’s capital Tuesday, with emotional testimony during a legislative hearing on a bill to raise the age limit to buy long guns from 18 to 21, and create a program allowing teachers to carry concealed weapons in their classrooms, if their school district allows it, they get law-enforcement training and are deputized by the local sheriff’s office. The Broward superintendent has spoken out firmly against the idea of arming teachers. Hogg also thinks the idea is misguided. The House Appropriations Committee’s 23-6 vote in favor of the bill Tuesday followed more than four hours of emotional discussion with the parents of some of the 17 killed, and nearly two weeks of activism by students on social media and in televised debates. Gov. Rick Scott, who met with officials in Miami-Dade County on Tuesday, said at a news conference that he hopes a gun and school-safety bill is passed before Florida’s annual legislative session ends on March 9. He had proposed measures that overlap with the Legislature’s plan but did not include arming teachers. However, he declined to say Tuesday whether he would veto the sweeping package if it included that provision. The Senate’s version of the school-safety bill was approved by a second committee on a 13-7 vote Tuesday evening. Sen. Bill Galvano, who is designated to become the next Senate president and is ushering through the bill, said the earliest it will be considered by the full Senate is Friday. Marion Hammer, a lobbyist for the National Rifle Association and Unified Sportsmen of Florida, told the House Appropriations Committee that she supports tightening school security and keeping guns out of the hands of the mentally ill, but not the House bill’s gun-ownership restrictions, which she later said would not have stopped the Parkland shooting. Max Schachter, father of 14-year-old victim Alex Schachter, said the bill the House committee eventually approved doesn’t go far enough — but could have saved his son. “If we would have had these measures in place, I would not have had to bury my son next to his mother a week and a half ago. … I’m pleading for your help. I’m willing to compromise. Are you?” he asked.